Stop and Smell the Chocolates: Tea for Two-sday ~ Mug or Cup? Tea for Two-sday ~ Mug or Cup? Tea in a mug, or tea in a cup? When the brewing time is up? Both can be pretty and both can be plain. You'll find they're much the same. Personally, I think you should drink your tea in whatever cup, mug, pot, etc. makes you the most happy! There may be slight differences, but I think most of it is just due to how well it holds the temperature of the tea. If you look around online, there are some thoughts on which one is best - though opinions vary widely. I'm not here to educate you on what your tea should be served in. I'm just wondering what your preference is. I have both cups and mugs that I use; it really just depends on my mood...and what's clean...LOL! Do you like tea in a mug or tea in a cup (or something else)? And what does your favorite cup or mug look like? Good morning Lisa! I go with what's clean...which at any given time, may just even be a dixie cup! LOL! The white styrofoam ones of course! LOL! Love your little rhyme! That was too cute! Oh, you have to have a tea cup. :D Antique or cheap doesn't matter. Otherwise the tea doesn't brew right (it's too weak in a mug) and you have weak tea! 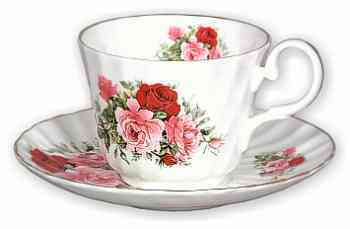 There is something special about drinking tea from a thin china tea cup and I always use tea cups when I have guests. On a normal day though anything goes. I have some large mugs that hold two cups of tea and while they aren't beautiful, they sure are practical. I don't like tea (C; Unless it's a chai latte! But if I did, it would be in a mug! I usually choose a mug. Unless I plan on drinking a pot of coffee while I blog, then I use a tea pot and fancy cups from my great grandmother. cute poem! I like poems that are easy to digest. I'm actually a coffee drinker and I don't even own a tea set. So my guests need to drink from mugs. I like mine in a tall glass with ice most of the time. Sometimes for dinner all of us (except Brett) use our own favorite cups that we got from tea parties, friends or I gave to the children. Of course those are the ones that the boys haven't broken yet. For the record I think your little poem is meaningful and lovely. A is for Always share with a friend. Cute! When I was in college, I majored in Vocal Music, so I drank Tea with Lemon and Honey a lot in a large mug. I drink Coffee more, now, in a purple insulated mug! Sugar Free Mocha Carmel Latte!